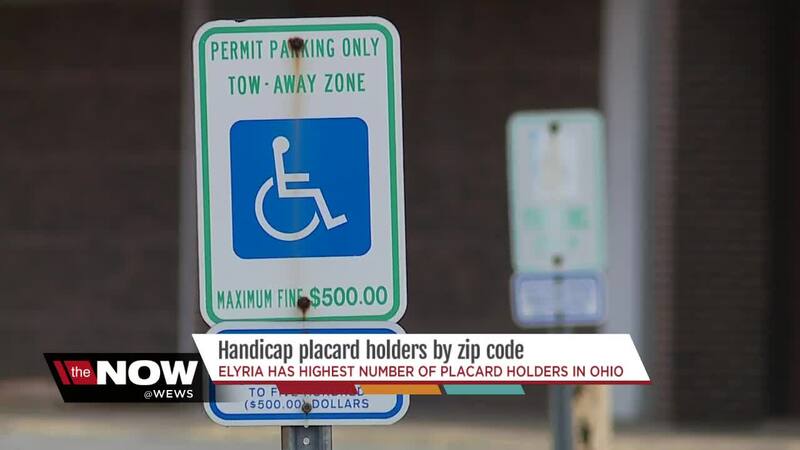 State documents show that the two zip codes in the state with the highest number of registered handicap placard holders are in Northeast Ohio. Zip code 44035, which includes the city of Elyria, is at the top with 10,007 placard holders, according to the Ohio Bureau of Motor Vehicles. One in every five residents there has a placard. "It [the parking lot] is just full all of the time," said Raymond Gaines, an Elyria resident who is a handicap placard holder. "You come to the store. There seems like there's just not enough space." The zip code with the second highest number of placard holders is 44130, which encompasses Parma Heights and Middleburg Heights. There are 8,863 holders, or roughly one in every six residents. "How easy is it to get a handicap placard from a doctor?" "It's probably not as easy as it seems," said Alexander. To receive a handicap placard in Ohio, a doctor must sign off on the application, certifying the patient is entitled to one. There is specific medical criteria that each doctor must follow before granting someone a tag. In Cuyahoga County, the number of placard holders has been steadily increasing in recent years and far surpasses the number of placard holders in Franklin County, which is of similar size. "We're going to see this trend," added Alexander. "The baby boomers, as they get into their senior years, they're going to be a bigger and bigger piece of the population." In 2016, there were 153,804 placard holders in Cuyahoga County as compared to 117,971 holders in Franklin County. Both Elyria and Parma Heights police said they do routine handicap placard enforcement. "Most often what we deal with is when all of the spots are full except for the ones right up designated for the handicap right by the entryway," said Ptl. Luke Berry of Parma Heights police. "So people take advantage of that easy spot." In a ride-along with Parma Heights police, News 5 witnessed an officer ticket two cars for displaying expired tags. The fine, $250. Placards are good for five years before one has to re-apply through the Ohio Bureau of Motor Vehicles. The map below shows the top 10 counties in Ohio that have placard owners and population.